There are hundreds of jewelry organizers that can manage your necklaces, earrings, bracelets and rings. You’ll find jewelry organizers that match your taste and style. Here are a few practical and innovative jewelry organizers that I think you’ll love. help me avoid messy tangles. keep my jewelry together so I can find them easily. let me to see my jewelry at a glace. The right jewelry box will keep your jewelry in the best possible condition. Jewelry boxes offer a lot of space with different sized compartments. You can store jewelry as dainty as studded solitaire earrings or as heavy as large bangle bracelets and necklaces. Jewelry boxes can provide cushioning so that even if the box falls your jewelry inside remains safe. Jewelry tree organizers are a classic favored by women of all ages. It consists of a stand on a flat foot with hooks from all sides. They’re super for hanging necklaces, bracelets, earrings and rings in one place. You can find jewelry tree organizers in different styles, from cute figurines to simple and straight-forward T-shaped metal stilts on a tray. Jewelry wall rack organizers attach flat to a wall with either racks, holes or hooks where you can hang your earrings, bracelets necklaces, and rings. Jewelry wall rack organizers come in many styles, such as vintage wooden holders, metal racks, plastic stands, and many other styles. If you prefer something simple and basic a jewelry wall rack organizer is the way to go. Hanging jewelry organizer consists of a hanging canvas or wooden design with multiple rows of pockets on the front and back. You can hang it inside your closet, on your wardrobe, bedroom, or bathroom door. They’re simple but very practical! 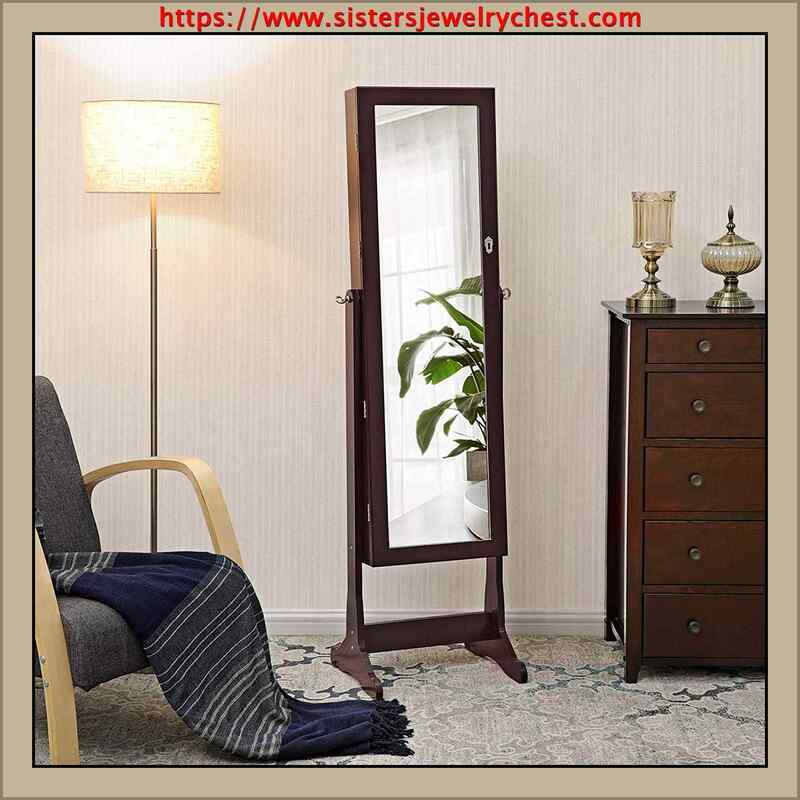 Many wooden Hanging jewelry organizer come with a mirror for even more convenience. Jewelry cabinet organizers are often called “jewelry armoire”. If you like having all of your jewelry in one place, then I think you will love a jewelry cabinet organizer. Jewelry cabinet organizers offer a lot of space for your jewelry without having to put them on display. Its like having a closet just for your jewelry. Many include a handy mirror. Jewelry cabinet organizers can hold more jewelry because they are made with several slide out drawers and often with a cabinet door on each side. Jewelry cabinet organizers are pricier but their worth it, especially if you have a lot jewelry. Jewelry tray organizers work wonderfully if you have an empty drawer that you can use to dedicate all of your jewelry. 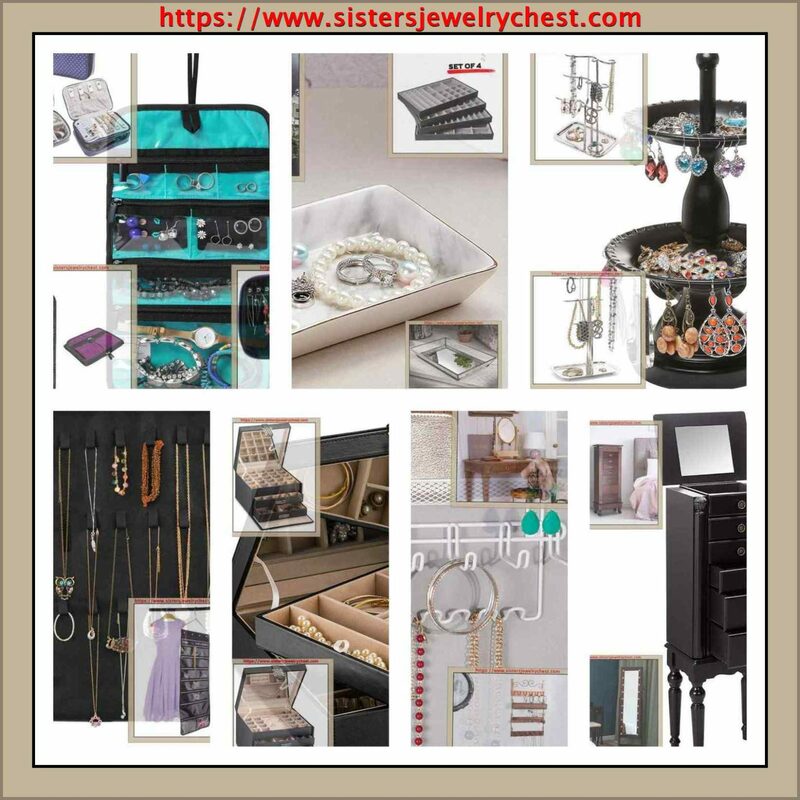 Jewelry tray organizers with a variety of storage locations can save you lots of space. Jewelry travel organizers are very useful when traveling because they keep your jewelry secure. If you’re going on a very long vacation or trip, a mini travel case is handy. Many jewelry travel organizers are made of fabric with zippered pockets to secure your jewelry in.